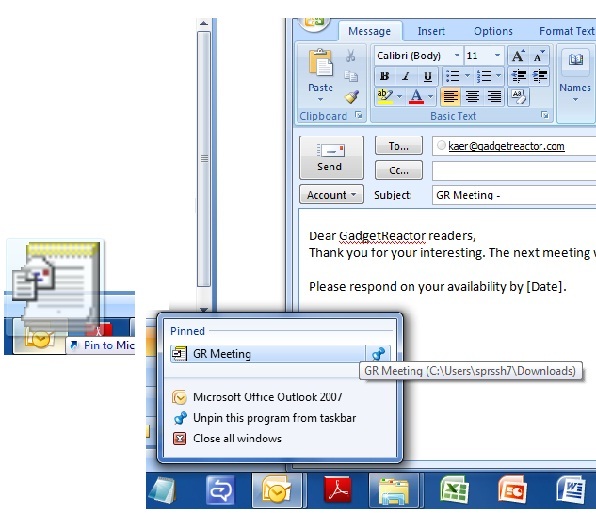 I use Microsoft Outlook for corporate email in the office and I bet most people do too. With email being such a big part of our work communications, it is important to learn all the important tips and tricks to maximize your Outlook efficiency. Impress your clients, customers and co-workers as you get things done in a timely manner. If you wish to quickly convert emails to a corresponding calendar entry, the most effective way I found was to right click on the mail and drag it to the calendar / tasks in the default bottom left corner. I use my Google Calendar extensively to plan my own personal activities. It is very useful as the calendar entries there are synchronised with my phone and provide me constant access to my schedule and reminders too. However, due to corporate policy and firewall restrictions, I am not able to sync my Outlook calendar or share it to my Gmail. So my workaround is that when creating a work entry in Outlook, I would invite my gmail account as an attendee. On Gmail, I set it up to auto accept invitations and also created a filter to archive the emails with calendar entry header so that it doesn’t clog up my mailbox. Do note that if you share your Outlook calendar with other colleagues, they would be able to see who you had invited. If your company has a less strict IT policy, you could just add your Google Calendar as a shared calendar in Outlook. There are some emails that you constantly send out on a frequent basis. I used to look through my sent mail, find the last email I sent out and select Reply all, before editing the message to send out again. Well, instead of this, how about just saving it as an email template? This would make future compositions much easier, with less searching and editing. Also, to quickly insert today’s date into an email text, you can use Alt+D. Create a new message and enter the desired template Subject: and content. Click the Office button and select Save As. Select Outlook Template under Save as type: in the Save As dialog. Type the desired template name (if different from the email subject) under File name:. I am using Windows 7. I drag the template and pin it to my outlook icon. When I need to access it, I would just click on the Outlook icon and drag up to access the additional menu. Alternatively, In the Outlook Inbox, select Tools | Forms | Choose Form… from the menu. Select User Templates in the File System under Look In:. Address, adapt and eventually send the email. Still hungry for more? Microsoft have a comprehensive list of Outlook shortcuts to help you navigate around Outlook in a speedy fashion. I am a big fan of Ctrl-F2 (Print Preview) and Ctrl-K in the address bar for quick finding of contacts.